INLEAD conducted LEAD Orientation Activity- Hullabaloo for all the programs of April 2013 batches. Activity was designed, keeping in mind the blend of students coming from different backgrounds. The biggest challenge for them was to break the ice between each other and be a part of a pre decided team.The activity was spread over a period of 2 days. The students were to prove their mettle and showcase their latent talents through the activities in which they were participating. The event kicked off on the 25th of July starting with Masterchef’2013. 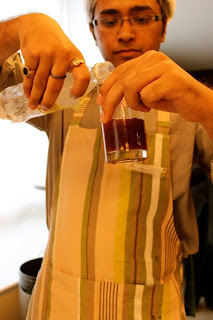 A team of 2 main cooks and 1 helper was made and the participants were to produce 1 mocktail, 2 savory items and a dessert as a part of the menu. The challenge was that they were to come up with an innovative menu and dishes as this was one of the parameters. 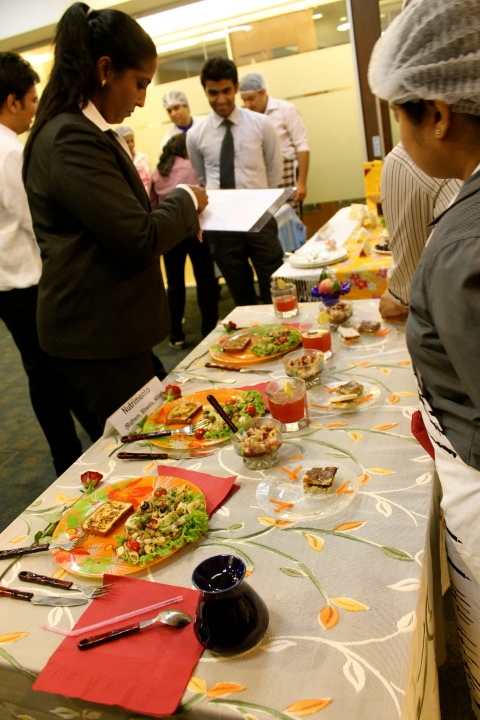 The participants were given 1.5 hours to prepare the dishes and 30 minutes post that to present the same to the judges for tasting. The participants worked hard to come up with a variety of delectable, mouthwatering dishes and delicious mocktails. It was a beautiful and colorful presentation of a variety of dishes. Along with Masterchef, other participants were showcasing their artistic abilities with Kaleidoscope – Sketching and Painting. The biggest challenge that was placed was that the participants were not supposed to use water colors, poster or fabric paints in their pictures. Even with limited means, the participants displayed brilliant brush strokes sans the brush and paints. Beautiful sketches and drawings were made by the participants which made the day more colorful. On 26th July, the day started with all the students participating in Hop to the Top – a series of games and activities which was fun filled and energetic. The games were all timed and required the participants to complete the given task and win prizes. The event was then followed by the AD Mad show in which the participants were to present innovative ads to sell certain items which were given to them. From selling diapers to broken combs, rotten apples to soap made from cow dung, the participants displayed great enthusiasm and energy and entertained the whole audience and the judges. Though it was a competition, the students showed the spirit of camaraderie and helped each other with their preparation. The activity gave insight in to team building, creativity, leadership skills etc. The student coordinators and organizers worked tirelessly along with the faculty to make the event a success. The display of the various skill sets and the colorful performance by the students made the event a success. The participants were awarded by Mr. Deepak Sharma and Ms. Khushboo Singh, Vice President, INLEAD. The event was drawn to a close with the crowing of Mr. and Miss Fresher and the dance floor thrown open for the students.